As the 5 year-old dressage horses took center stage at the 2013 Bundeschampionate on 4 - 9 September 2013, three ladies and their three youngsters took out the medal winning spots and that with just 0.1 between each of the three top placings. Gold went to Marita Pundsack and QC Flamboyant, silver to Anja Wilimzig and Sir Heinrich and bronze to Ann-Kristin Dornbracht with Soiree de Saumur. Leading the pack with a total of 8.70, Germany's Marita Pundsack and the Belgian owned Oldenburg stallion QC Flamboyant (by Fidertanz x De Niro) scored their highest mark, a 9.5, in the trot. With 8.0 for walk, 9.0 for canter, 8.0 for submission and 9.0 for general impression. He totalled 8.7 to win the Finals test. Marita admitted that on the first day of competition she was a little nervous, but her horse was good. "Our only aim coming into this competition was to ride in the final and we never thought the we could get the Bundeschampion title, particularly as there are so many professional riders and good horses," Punsack confessed. Bred by Werner Meyer, Marita discovered Flamboyant when he was 3 and Marita's husband, Marco Pundsack, rode him as a 3- and 4 year-old. The majority share in the bay is owned by Belgian Patrick d'Eer, who has celebrated much success this year as his 3-year old mare Calamity Jane also became the 2013 Oldenburg Elite Mare Champion in Rastede in June. "The horse was reserve horse for the 3-year old Oldenburger stallions for Warendorf in 2011 and at the end of 2012 I took over the ride from my husband. He is a very beautiful horse with a very good and kind character and he is very aware just how good he looks," she said. A macho-man on competition day, Marita knew that everyone looked at him and he liked that a lot. "During tests he is very concentrated and very good to ride and he gives everything," Maita explained. Training for some time with Dieter Weichert, Marita also receives advice from her husband, riding all days at the stable of Patrick D'Eer. "We have worked with him for 5 years now and it is a very good relationship. He has the big QC stables in Puurs, Belgium, and we are constantly getting very good young horses from him to ride. He buys 10 to 20 foals every year and breeds himself too and at the moment with Mr. D'Eer we have a 6 year-old Oldenburg gelding by Rubin Cortes and a 3 year-old Oldenburger mare by Sir Donnerhall." One of their projects was QC Ruling Cortes (by Rubin Cortes) was placed at the Bundeschamionat when she was 5 and 6 years-old, before she was passed to Imke Shellekens-Bartels and sold as a Grand Prix horse to the USA. Not out to make money from riding horses, Marita says dressage is the hobby that she and her husband share while they also build a family. "My husband works at a bank and I work for the Pony Stud Book Weser-Ems in Vechta. Last year had our first son, Justus, who is now 1." Indulging in the biggest moment in Warendorf Marita loved to ride the big lap on honour in the evening, with so many people happy with the pair and sending their congratulations, and perhaps even making an offer on a future star. "We have some people who are interested in buying QC Flamboyant, but we have to wait and see what that brings," she stated. Second by only 0.1, Anja Wilimzig and chestnut Oldenburg stallion Sir Heinrich (by Sir Donnerhall I x Furst Heinrich) maintained a consistency in their scores to finish just behind the winning pair. The combination won the preliminary round in group 2 with a score of 8.60 and they were able to maintain that score through the final round. The elegant chestnut stallion, whose 4-year old full sister Cindy won the title of the 4-year old Riding Horse Bundeschampion, put straight 8.5s on the board for walk, trot, canter and submission. With a 9.0 for general impression, Sir Heinrich averaged 8.6. Bred by Georg Peinemann, Sir Heinrich is owned by the Westfalian State Stud in Warendorf, where Wilimzig is one of the head riders. The judges described the licensed stallion as a "dressage horse with much potential for the future." 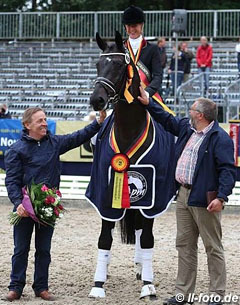 Ann-Kristin Dornbracht and Soiree de Saumur (by San Amour x Latimer) scored a total of 8.5 to earn bronze at the 2013 Bundeschampionate. Given it was her debut performance at the Bundeschampionate, Ann-Kristin is especially proud of her bronze medal. Soire de Saumur descends from a successful family with her full sister, Soiree d'Amour taking out the 2012 Bundeschampion's title in the 3-year old division last year under Kira Wulferding. "We bought Soiree de Saumur (aka Lara) last year in November from Marten Hillmann, who was the first to ride Lara, and this year Lara and I started our first competition in March in Dressage Horses A-level, where we were immediately placed," Dornbracht told Eurodressage. "After that we decided to start Lara in the qualifications for the Bundeschampionate and we gained the possibillity to start in Warendorf at our third qualification. Since then Lara has placed in every show." Glad to be offered the chance to show off the talented mare in Warendorf, Ann-Kristin feels that Soiree de Saumur is an amazing horse with many outstanding qualities. "Not only her good gaits but even her temperament is perfect," she said. "She is willing to work every day and gives her best everytime. She loves to compete, so in a show she is a litte bit better than in training at home." Trained by Jan Bemelmans at his stable in Ratingen near Düsseldorf for just over two years, Lara resides in Iserlohn where she has her own yard. "Jan and I try to built Lara up in a calm and careful way, as she is a very sensitive horse, who is very focused on her rider. Over the winter we want to start with the flying changes and next year we try to start at the Bundeschampionate once again."